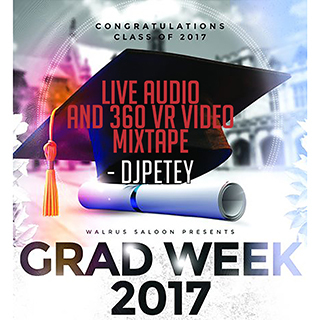 DJPetey – 360 VR Video – LIVE at Grad Week 2017 | DJPetey.com!!! I put together a LIVE 360 Virtual Reality video for Grad Week this year. Basically, I recorded my sets on thursday and saturday night and pieced it all together into one 26 minute video and mix. Next time, I promise Ill get better angles, but this is pretty cool! As far as watching / listening, you have a few options. If you want to just watch the video on your laptop, you can still drag around to get the full views, but it takes the virtual reality part out of it. If you wanna go that route, I embedded the video below.